As landscape painters why are so many of us obsessed with bottoms? Why do we feel the compulsion to describe everything in minute detail? It’s not necessary and in fact detracts from the overall effect in a painting. I have cut out some of this composition so that we can get in closer to view the relevant bits. Note the drystone wall on the left, the white walls of the buildings and the small gate immediately to the right of the barn, and how I have not rendered a definite bottom line in each case. By omitting this I have endeavoured to make the effect more natural. Usually I only paint in the top two or three bars of a five-bar field gate. You can see that for the right-hand hedgerow I have indeed given it a fairly distinctive bottom, probably a minor aberration when I was desperate for coffee! It’s not a great problem as it is in the distance and the bottom part of the hedgerow could be softened off with a damp brush. So watch those bottoms as you’ll get a more natural effect if you keep them soft. Hard boundary lines around a feature can make it look cut-out, rather like a garish sticking plaster on a donkey’s ….er, bottom. The watercolour was painted on the fabulous Saunders Waterford 200lb rough high white paper in order to make the most of the textures on the hillside. 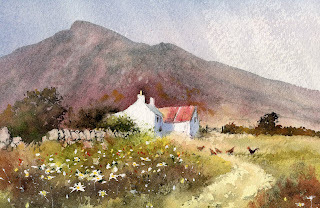 This entry was posted in 'Lost and found' painting technique Llandoddies, aerial recession in landscape paintings, David Bellamy, Simplification, ST Cuthberts Mill and tagged Saunders Waterford, St Cuthberts Mill by David Bellamy. Bookmark the permalink. Loved this blog David… When are you next demonstrating at Bookham? What a lovely blog David ! … and a beautiful inspirational painting. This high white paper is my all time favourite too especially in the weight and texture you suggest. Your useful tips are much appreciated, many thanks ! Dear David Bellamy, Another very beautiful painting from you and very valid point about bottoms. Preseli’s perhaps. Wish I was there,though spring is lovely everywhere. Somehow even in a loose painting there is a temptation to underline features instead of fade them out. Point noted. Your palette seems to have changed markedly from when it seemed dominated by purples and yellows for instance in your Pembrokeshire book. I admire all your work hugely. The colours in the painting above are very lovely. I have not yet tried out the Daniel Smith colours but the SW 200 lb Rough is my favourite paper. Thank you for your valuable insights. Thankyou for this instruction. Very helpful. And a beautiful painting. What size is the paper please? I presume it is large, being rough. Love your books and videos. I find what to leave out the hardest bit. Any one else?? Many thanks for this article and I definitely see what you mean. Good advice. Sort of like doing roofs also. No definition is needed for every tile, I only put in a few to suggest it. I’m intrigued with the gray’s and greens you use. What colors do you mix to get the various grays and greens?